It’s hard to choose a vitamin supplement with the many synthetic and natural choices available today. What should we know about synthetic vitamins and how they’re processed? Are natural vitamins always better for us? Actually, the most important factors are digestibility and potency. And synthetic supplements may help you ingest more of the vitamin than you would typically get from food. Last week at D2D, we explained why vitamins and minerals are important to maintain both your short and long term health. So, we know we need to ingest vitamins to stay healthy, but now we need to investigate what type of vitamins we should take. 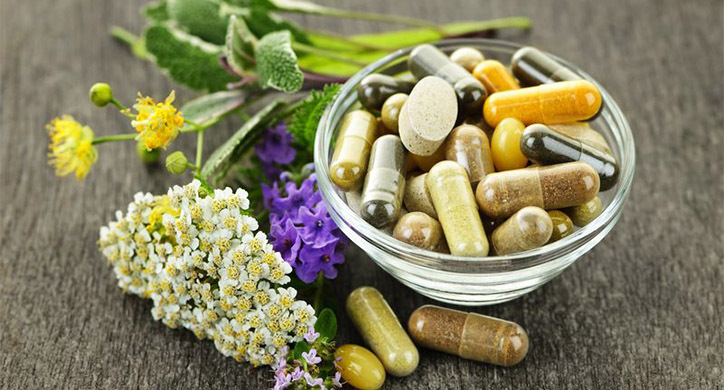 If you turn to the Internet for help, you will find there is a lot of criticism from various nutritionists and natural vitamin companies on the use of synthetic vitamins; in particular, arguing that our bodies do not know how to digest these supplements. But is this true? Or is this another marketing ploy to make you buy the more expensive, naturally-created vitamins? First, what is a natural vitamin? Similar to ‘natural’ foods, the natural vitamin label is not clearly defined and can be very misleading. A natural vitamin can be made from a component directly from the earth or it can be ‘naturally made’ in your body through digestion. Or, it can be a product, like vitamin B, that begins with natural fermentation but is additionally processed. The most typical all-natural vitamin is classified as something that is created directly from plant material. However, since pills obviously don’t grow on trees, the only completely natural vitamin is something that comes directly from your food. To remove any vitamin from its natural source is a tricky and expensive process that also reduces the potency of the particular nutrient. Isolating a specific vitamin from its source, like Vitamin A from cod liver oil, does not necessarily yield 100% of the vitamin. So you have to ‘synthesize’ the vitamin anyway to reach full potency. The molecular structure for each vitamin is well known. Those nutrients are exactly replicated in the lab to support their specific cellular structure and function. Because the vitamin is specifically isolated, the lab can easily control the purity and quality. The only exception is vitamin E, which is important as an antioxidant and good for your skin. Vitamin C combined with vitamin E may increase the photoprotection of your skin more than vitamin E by itself. Naturally-occurring vitamin E such as spinach, nuts, and oils, contains eight molecules called tocopherols and tocotrienols. A synthetic vitamin can only capture one tocopherol. Look for a ‘d’ label before the word alpha-tocopherol rather than a ‘dl’ label which means it is synthetic. Aside from Vitamin E, there is no difference between natural and synthetic vitamins. 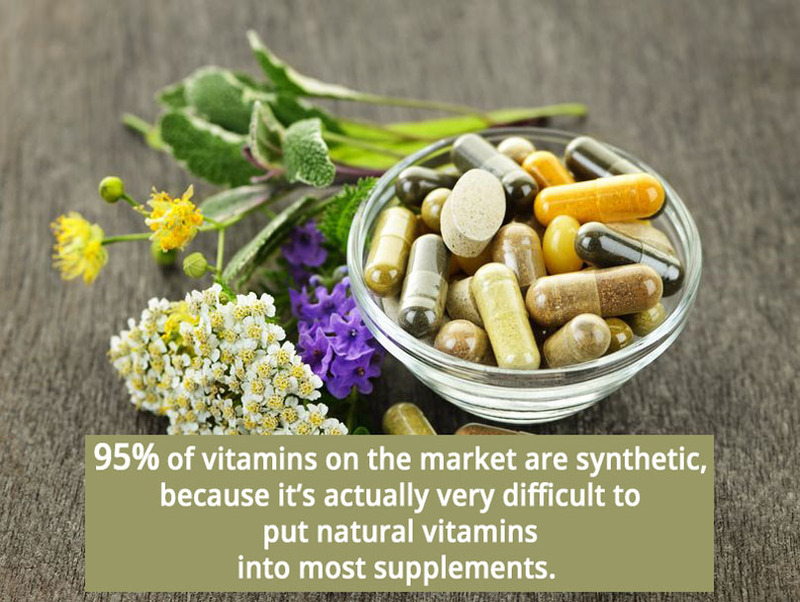 In fact, 95% of vitamins on the market are synthetic, because it’s actually very difficult to put natural vitamins into most supplements. When looking at a label you will see that vitamin ingredients are identified as either “d-“ or “dl-“. If the ingredient is labeled with the prefix “dl-“, it means the ingredient is synthetic, whereas the prefix “d-“ indicates the natural form. Save your wallet – Natural is not the only option. “All-natural” vitamin companies often tout their process of creating “natural” vitamins as being better for your health. Natural supplements are typically far more taxing on your budget than synthetic supplements. Companies producing all-natural vitamins indicate their products are free of artificial flavorings and colorings, chemical preservatives and excessive excipients (inactive substances that are carriers for active ingredients). Natural companies use only natural flavoring agents such as herbal extracts, lemon, and vanilla with no chemical dyes. Synthetic supplements are criticized for using binders to hold tablets together, or fillers such as cellulose or magnesium stearate for encapsulation. Cellulose is a vegetable plant; if you eat lettuce or spinach, you are eating cellulose. Magnesium stearate is used to make sure the ingredients blend together proportionally and easily slides through the manufacturing process. It is basically a combination of stearic acid (a saturated fat found in beef, cocoa butter, and coconut oil) and magnesium salt. Both are recognized as GRAS (generally regarded as safe) by the FDA. Natural vitamin companies often claim that your body will not know how to process vitamins that have been created synthetically. The main criticism is that synthetic vitamins are ‘isolated’ and since they are not working in conjunction with other vitamins, enzymes and minerals the human body does not recognize the isolated ones. The purpose of taking a vitamin is to get the benefit of the nutrients. Reputable labs will actually create a ‘human stomach’ to test how the vitamins break down and release the nutrients. They copy the temperature, average acidity, and how the stomach churns during digesting. Of course, there are individual variants such as your gut microbiota, your age, and your overall health that will affect how your own body digests and absorbs the vitamin. The FDA and WHO do not distinguish between all natural and synthetic vitamins. In fact, dietary supplements are not regulated by the FDA the same way drugs are – and with good reason! This is due to the fact that you can make therapeutic claims for drugs, which you cannot do for dietary supplements. In terms of vitamins, the FDA regulations are responsible for the purity, potency, and safety of dietary supplements being created. They concur that the molecular structures of nutrients are well known and the body cannot tell if a nutrient came from a lab or a plant. Thus, synthetically created vitamins are not taxing on your body. The question is not whether a vitamin is synthetic or natural but was it made by a reputable manufacturer that uses FDA Good Manufacturing processes and uses a third party for their testing. Be sure your vitamin supplements (whether they are synthetic or natural) are tested for toxicity and contaminants, are properly labeled, and will break down in your body in the appropriate amount of time. 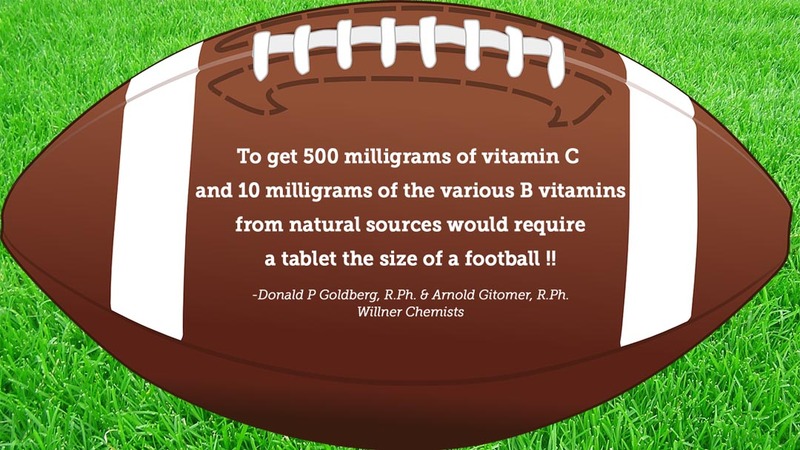 Natural vitamins cannot achieve the same potency as synthetic vitamins. When your diet falls short, a vitamin supplement is the best option to achieve the daily recommended amount, and natural supplements are not as effective. While synthetic vitamins get a bad reputation, remember not all vitamin supplements are created equal. We recommend purchasing natural Vitamin E supplements and checking with your doctor to find a vitamin supplement that will work best for your body.